Tropical forests play a disproportionate role in regulating global climate; while only representing 12% of the land surface, tropical forests perform 40% of all photosynthesis on land, helping to remove carbon dioxide from the atmosphere (1). Nutrients – primarily nitrogen and phosphorus – limit plant growth and therefore the ability of forests to capture carbon via photosynthesis – especially with rising levels of atmospheric carbon dioxide due to human activity (2, 3). Understanding the factors that influence the abundance of these essential plant nutrients in tropical forests will improve our ability to predict the pace and magnitude of global climate change (4). The Houlton biogeochemistry research group, located at the University of California – Davis (UCD), has been collaborating with BFREE botanist and UCD alumnus Dr. Steven Brewer since 2012. 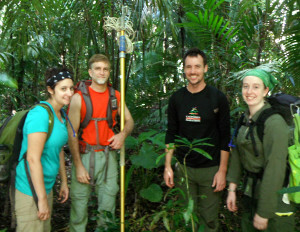 Together, we are investigating how variation in plant biodiversity, soil chemistry, and rock type influence the availability of nitrogen and phosphorus in tropical forests. 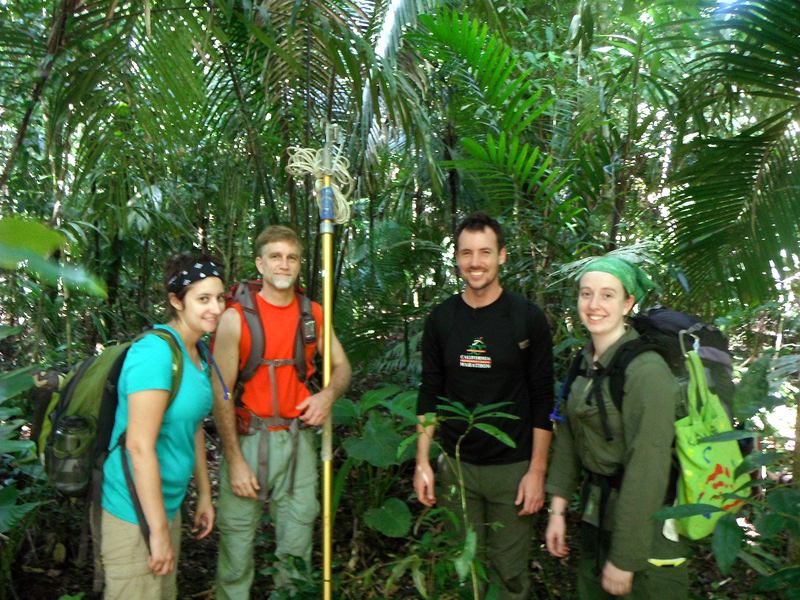 We are excited to work in the pristine Bladen Nature Reserve in Belize where there is the greatest diversity of plant species in all of Central America (5) and significant variation in soil chemistry and geology. Ecologists have long been fascinated with the puzzling nature of nitrogen (2). Despite the fact that 80% of our atmosphere is composed of nitrogen, most ecosystems on earth are limited by this element. This limitation persists because only a select group of bacteria have the abilities to convert di-nitrogen in the atmosphere into forms that living organisms can use to produce essential amino acids and enzymes. This process, known as biological nitrogen fixation, is the most energetically expensive process performed by life on earth! It requires a huge amount of carbon and phosphorus to provide energy (6). Phosphorus, unlike nitrogen, ultimately comes from rocks. Tropical forests are extremely old ecosystems and thus much of the phosphorus has been weathered out of the soils. In addition, phosphorus can become bound to the soil and made no longer biologically available (7). The Houlton lab group and Dr. Brewer have been investigating how variation in rock types influences the availability of phosphorus and the process of biological nitrogen fixation in tropical forests. Within the 100,000-acre reserve there are two different rock types: forests in the northern section grow on volcanic rocks, while forests in the southern section grow on limestone rocks. We have established study sites on each rock type, and have returned multiple times throughout the year to characterize the chemistry of these forests. At each site we collected leaves, rocks, and soils, which we bring back to the lab to measure their chemical composition. We found that the chemistry of leaves and soil differ substantially between these two rock types. Limestone forests have on average fifteen times more total soil phosphorus than volcanic forest soils. These differences in phosphorus positively correlate with total nitrogen in the soils and rates of biological nitrogen fixation in decomposing leaves on the forest floor. These results suggest strong interactions between the phosphorus and nitrogen cycles in these tropical forests, ultimately influencing the ability of these systems to photosynthesize and capture atmospheric carbon. We hope in the future to begin to explore how nutrients and plant biodiversity influence carbon storage in these forests. A. R. Townsend, G. P. Asner, C. C. Cleveland, The biogeochemical heterogeneity of tropical forests. Trends in Ecology & Evolution 23, 424–431 (2008). P. M. Vitousek, R. W. Howarth, Nitrogen Limitation on Land and in the Sea: How Can It Occur?, Biogeochemistry 1–30 (2007). Y. Luo et al., Progressive nitrogen limitation of ecosystem responses to rising atmospheric carbon dioxide. BioScience 54, 731–739 (2004). Y.-P. Wang, B. Z. Houlton, Nitrogen constraints on terrestrial carbon uptake: Implications for the global carbon-climate feedback. Geophys. Res. Lett. 36, L24403 (2009). S. W. Brewer, M. A. H. Webb, A seasonal evergreen forest in Belize: unusually high tree species richness for northern Central America. Botanical Journal of the Linnean Society 138, 275–296 (2002). J. Raymond, The Natural History of Nitrogen Fixation. Molecular Biology and Evolution 21, 541–554 (2003). T. W. Walker, J. K. Syers, The fate of phosphorus during pedogenesis. Geoderma 15, 1–19 (1976).